COLOR(S): Silver, fawn, apricot, or black, with black muzzle, mask, and ears. The Pug is "a lot of dog in a small space". 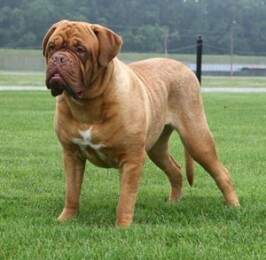 It is a stubby and muscular dog with a wide chest, straight, very strong front legs and well-muscled hind legs. It received its name Pug from the Latin word that means "clenched fist". To communicate with humans it makes a grunting nasal noise, somewhat like a pig. Snuggled down at your feet snoring or being close to you, but unobtrusive, are some of its favorite activities. Some of the breed’s talents include: watchdogging and performing tricks. The Pug is a perky, rambunctious, loyal, affectionate and loving little dog with a happy disposition. It is very devoted, playful, charming, clever and mischievous with a heart-winning personality. This breed is highly intelligent. This dog requires lots of attention and may become jealous if its owner ignores it. The Pug is sensitive to the tone of your voice; harsh punishment is unnecessary. It can be a bit willful. It bores easily with repetitive training practices. It gets along well with other dogs and pets, and behaves impeccably with both children and visitors. The Pug makes a good watchdog, it doesn’t bark unnecessarily. It responds well to basic training but needs a gentle hand. The Pug is a strong dog, enjoys energetic games and will keep in better health if given regular exercise. But be careful not to over do it, especially if you see it start to wheeze. Pugs can suffer from luxating patellas, skin problems, deformities of the mouth and nose, eye and eyelid problems, heatstroke, hip dysplasia, Legg-Perthes disease, epilepsy, and Pug Dog Encephalitis. The Pug will enjoy a romp outdoors, or a walk around the block. Be aware, however, that this breed is also sensitive to strenuous exercise, and should not be over-exercised, as it is difficult for them to breathe. Daily, consistent, and non-strenuous exercise is the key. Pugs respond well to basic training but need a gentle hand. They will be sensitive to your tone of voice, so harsh punishment is unnecessary. Learning Rate: High. Obedience – Medium. Problem Solving – Low.